New items are at bottom of page. The large wall section is 2 15/16" wide x 3 1/4" tall. It is intended to be used for any place you may need a industrial look. It will work for just about anything. The access hatch is part of it, and can be used on the card model with this wall section. You will need a 2/0 brush to paint up the detail on this one. 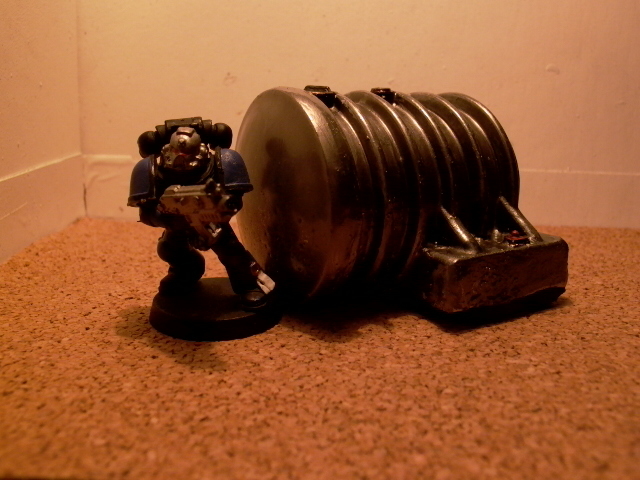 Warhammer 40K model used for scale. You can use it as fuel tank, toxic waste, etc. Exactly where it came from no one knows. The squad that came accross it called it "CAVERTO". Short for CAVO EVERTO, which is dig demon in Latin. It can be used for areas of diffacult ground. 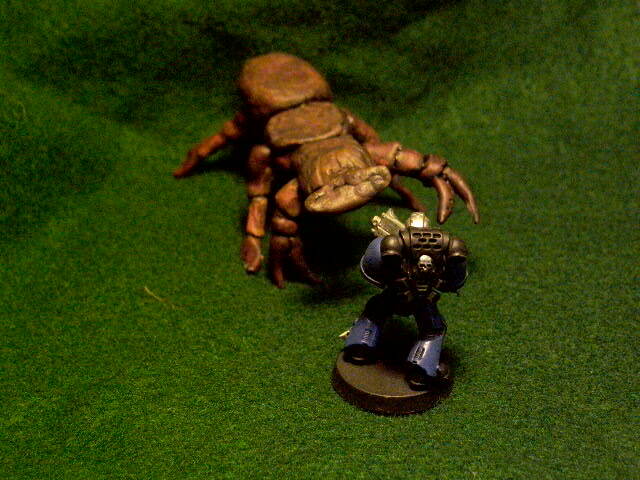 The legs are segmented and can be fully posed. Also the body is 3 parts which can be positioned any way you want. As for rules on this monster, well that is up to you. Poisen no poisen, or bullet proof, etc. All of that is up to you to make up as you wish. Can be built in any position you want. For areas of diffacult ground. Here is a wall you can use on a card model. The access hatch is also part of this set. This is the storage tank on the left. 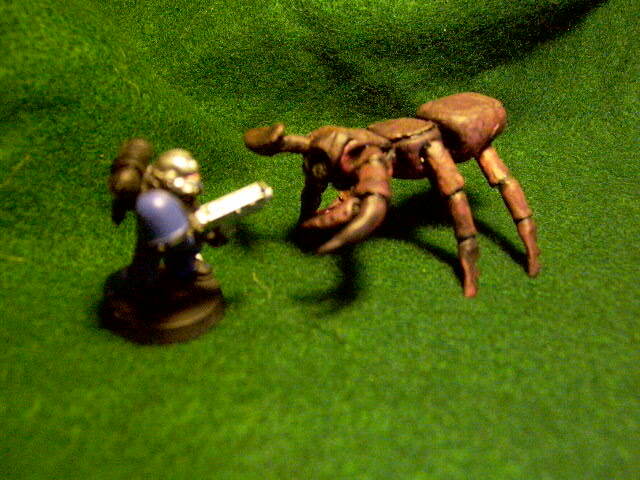 It is priced at 7.00 due to size, and measures 2 1/4" long x 1 5/8" round x 1 3/4" tall. square base is 1 3/8" long x 1 1/4"wide x 3/8" thick. It is poised ready to pinch off your head. Assemble, prime and paint it to match terrain. You can take a regular card model and add the wall piece. It will make a cardboard model look like a industrial machine of somekind. Add some of storage tanks and other pieces and you will have a complex to fight battles in. All you need is a good imagination to design a cool terrain piece. 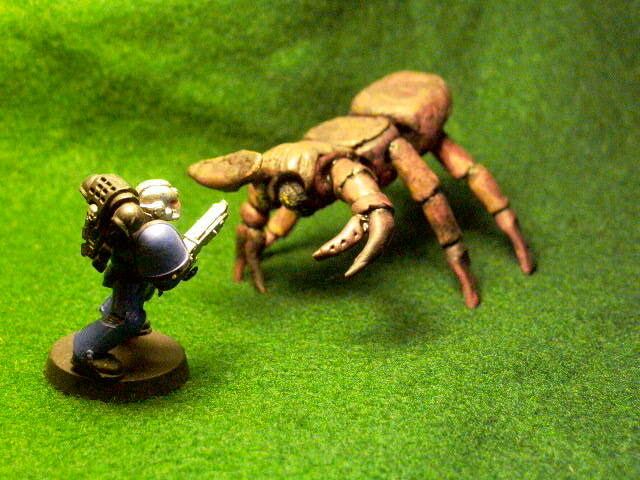 Maybe even add in CAVERTO to the terrain piece, as a unwelcome guest.